I grew up in the ’70s watching TV shows like Lost In Space, The Brady Bunch, Little House on the Prairie and The Waltons. All shows I could relate to and at times felt like I was living the real life version. Well, with the exception of Lost in Space. That was just unreal “sci-fi” and was only a fantasy of my mine to own a robot that I could tell what to do. The one show, where I aspired to be most like the character was The Mary Tyler Moore Show. I loved Mary. I loved her job, her friends and her sense of style. I really loved her belted sweaters she wore with a scarf and who didn’t want to wear bell-bottomed pants? But what I loved most, was her apartment. A studio apartment with a sunk-in living room. A small kitchen with a ceramic pumpkin cookie jar. I know what you’re thinking, “who remembers details like that?” I do. I loved that apartment. And the best part was, the apartment was in the big city of Minneapolis. Growing up in Beaverton, Oregon the big city life of Minneapolis seemed worlds away and very appealing. When we knew we were moving to Shanghai, and were told we were going over on a house hunting trip, we talked through the different options of living. You are sent a check-list to complete by the property search agency prior to your arrival so they can pull available properties together to show you. The questionaaire ask things like family profile – single, couple without children, couple with children. What type of housing – Apartment, Villa, Serviced. Serviced, we found out, is much like a hotel, housekeeping services, concierge, and 24-hr front desk and securtiy. You are asked if you would like to live in the Pudong (new) or Puxi (old) providences of Shanghai or other (downtown). What maximum commute time is acceptable to and from the office? A list of amenities like outdoor space, balcony, Ayi Room (maid’s quarters and we’ll come back to this later), tennis courts, swimming pool. Do you want an on-site gym and how about satellite TV? Moving to a big city like Shanghai, I knew this was my chance to live out my MTM fantasy and with Greg’s supporting comment of “let’s live in a high-rise, in the city. A place like nothing where we’ve ever lived before” I checked the boxes for Couple, no children, no pets, serviced apartment, other (city), balcony, gym, swimming pool and satellite TV. We spent three days in a van, with Jessie and her associate George looking at serviced apartments in downtown Shanghai, the Pudong (new) and Puxi (old). We looked at older buildings and brand new. Let me explain what older means in Shanghai. You have to know that the city of Shanghai has really been built in just the last 10 years. It’s exploded in both growth of people and the economy. When we went to look at apartments, Jessie would tell us this is an older building. I was thinking older like SE Portland old with character only to find out old is 6 to 7 years old. The finishes are not made to last. It seems to be a very disposable type of housing. Not the buildings, but the insides. After 5 years or so, they just gut the insides and do a complete remodel. Most apartments we saw had been remodeled within the last couple of years. They were all completely furnished including dishes, coffee maker and rice cooker. I had to ask what the rice cooker was sitting on top of the counter as the rice cooker I have was a wedding present and looks nothing like the new current version. Both Jessie and George laughed at my question. In the back of most kitchens is a small room with a bath attached. It has a separate entrance to the apartment. This is the Ayi or maid’s quarters. I kept saying we won’t need an Ayi and Jessie kept telling us it’s included in your allowance. I asked her why would we need one in a serviced apartment? She asked us who would do your laundry and ironing? The service that comes with the apartment is only for housecleaning and linen changing and they only come twice a week. I’m thinking, this is so much like home. Most Ayis live with you. That’s what the back room is for. This is where Greg weighed in with a strong opinion. We do not need an Ayi. I do not want someone living in the back room of the apartment while I’m home all day. We can do our own laundry. So we went with a serviced apartment on the 20th floor in the heart of the city. A two bedroom, two bath, newly renovated apartment. We’ll be the first to move in after the remodel. It has a state of the art gym, community outdoor space, tennis courts, indoor swimming pool and satellite TV. By the way, Greg has the entire TV thing worked out so he won’t miss a single Duck game. He’s purchased Slingbox. A device attached to a dedicated TV here in our house in Portland, that allows you to watch any show live or recorded on your DVR through your laptop attached to your TV anywhere in the world – including China. Trust me, it works. 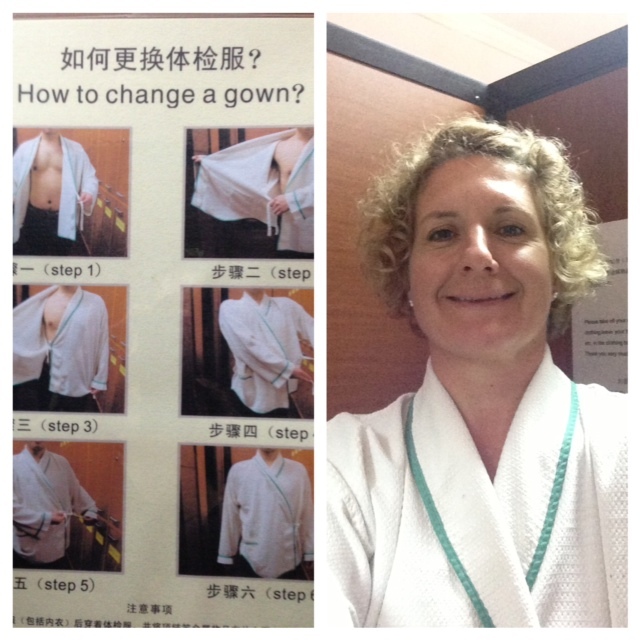 He tested it on the layover in Tokyo and was the first thing he did when we checked into our hotel in Shanghai. So in four days time we opened a bank account, went through a government mandated physical, looked at 16 potential properties, had some great food and went to a buddhist temple. We’re home now. I’ll be heading back the first week of September and Greg will follow the first of October. 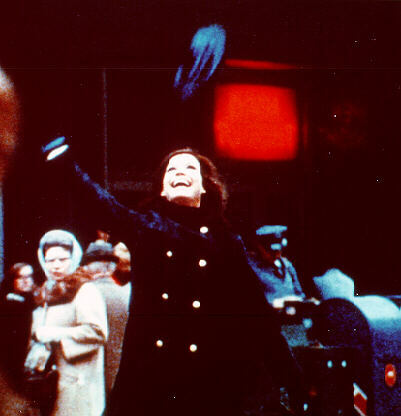 Look for blogs to start up again after the move and for sure a picture of me reenacting the scene of Mary Tyler Moore, standing in an intersection, throwing my hat up in the air while twirling around as some lady looks at me like I’m some sort of foreigner. As an expat with NIKE, you’re not allowed to drive in Shanghai. You’re required to hire a driver. With 20 million people living and working within Shanghai – I’m perfectly fine with that requirement. The NIKE China office administrative team sets up the interviews. They work with an agency that owns the cars and employs the drivers. You are asked what type of car you would prefer. There are 3 choices – a Dodge mini-van, a VW Passat or a Buick Lacrosse. You are also asked to provide a list of requirements of the driver. I wasn’t sure what my requirements might be for a driver. I’ve never had one. In fact, I don’t even like to be driven around by Greg. It might not surprise you but I don’t like to be driven by anyone. I like to drive myself. I like to be in control. When I asked Greg what we should ask for in the requirements he just smiled. I’m sure he’s looking forward to having a driver more than I am and not a driver for himself, which is also part of the employment, but a someone else who has to Drive Miss Daisy around while I constantly slam on the imaginary brake, grab the door handle when I believe were going too fast around corners and provide audible soundbites as we ride the tail of the car in front of us or race to a red light. I’m sure this will provide him with great amusement. We ended up meeting with 3 potential drivers. All of whom had worked previously for NIKE or Converse employees and all were from Shanghai. May, from the NIKE administrative team helped to conduct the interview just in case interpretation was needed. Our first interview was with Jay. Jay came in the door smiling. He handed me a letter of reference from his previous NIKE employee and quickly began sharing information about himself. He was 44 yrs old. He has been driving for 10+ yrs. I asked what his typical day might have been like and were there any special requirements from his current Expat employee. May asked him if he had children and where he lived. This is an important question, May explained to us later because if he has school age children he will be pulled to help with his family and may not be available as we need him. Jay shared he had a son who was attending college. May asked if there were any family obligations that may pull him away from his duties? Was he available for evenings and weekends? Would he be able to switch his one day off a week from a weekend to a weekday? He replied “no problem” to everything and added that he would have to “check with his wife” on some occasions. I quickly added “she’s the real boss.” Jay laughed out loud and seemed to really enjoy my joke. I was thinking, man, I’m funny in any language. After the interview Greg shared with me that when I stated “she’s the real boss,” Greg leaned back so I couldn’t see and pointed to me in agreement with Jay about who really runs the show. May had one last question for Jay, “do you smoke?” Jay responded “just a little bit” and he laughed a big belly laugh. Our next interview was with Kenny. Kenny was 45 yrs old. Seemed very serious and buttoned up. His english was perfect. He had a daughter in college. He was agreeable to all our requests. He didn’t smoke. He asked if I like sports and shared with me that he likes to walk 5k a day. Ron was our last interview. He did not have a letter of recommendation. He was visibly nervous to the point, I said, “just relax and take a deep breath.” May had to ask the questions in Chinese and he tried hard to answer the questions in english. He finally said “my english. no.” He asked May a question and she turned to us and asked if we would like to go see the car that he drives. We said sure and headed down to the parking garage. It was a brand new Buick and Ron opened the doors for us to get in the back. He then took us for a drive around the parking garage. He was showing us his driving skills would make up for his lack of ability to speak english. After all three interviews Greg and I sat with May in the conference room to discuss. She wouldn’t even allow us to consider Ron as she explained, your driver is your lifeline to the city. They help pay your bills – all done in cash by the way. Your rent and utilities are all paid in cash. You’re given a bill, you give the bill and the cash to your driver and he takes it to the utility office and pays it. He then returns with your receipt. 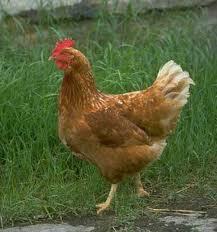 They help in emergency situations. We found out while on tour of the local hospital that if you are injured and still concious, you should have your driver bring you to the hospital. With 20 million people in the city, calling and waiting on an ambulance can take hours. The dispatcher determines your priority based on your call. The nurse showing us around shared the example of a broken foot. Use your driver or get yourself in a cab. An ambulance will not come to help you. Good to know. So considering all we now know we were faced to make a decision. We chose Kenny. We agreed Jay would be fun to have a beer with but that’s not really what you should be looking for in a driver. Kenny seemed very adult-like, no nonsense and wanted to share his city and culture with us. So when we return in September, we will be driven around by Kenny in our Black Buick Lacrosse. I can’t wait to start helping Kenny improve his driving techniques. Your Money or Your Blood? I’m not sure what’s wrong with me but sometimes when I’m put in front of anything to do with official government processes I tend to cramp up. This week in Shanghai, while we were mostly here for house hunting, we were also required to open an account at a local Chinese bank and get a government required “Healthy Checkup” in order to complete our visa application. I cramped up yesterday at the Industrial and Commercial Bank of China. Allow me to set the scene. It was not in a typical branch setting. This process took place in a small, crowded, unorganized office on the 29th floor of a high rise. There were 4 total employees but only one working with accounts and he was not happy. He sat in a cube with paperwork stacked all around and did not appear to enjoy his job. As I sat in front of him with a form that had to be interpreted by our NIKE provided guide, Jessie. Jessie is a Chinese national. Most Chinese nationals who work with American companies, pick an American name to use when working. As Jessie helped read the Chinese characters on the form I could feel a bit of sweat forming on my brow and running down the small of my back. The bank clerk never looked at me once as he began to input my completed document into the computer. He suddenly stopped, made a phone call, checked my passport again and handed me a new form stating “passport number wrong.” I had transposed two numbers. He crumpled up the old form and threw it under his desk. I wanted to ask about shredding or confidential recycling but it just didn’t feel like the timing was right. Now sweat is forming on my shins. Yes, my shins, I was nervous. I completed the new form and handed it back. This time, I had put my passport number in the box where birthdate was supposed to go. He handed my another form and stared into his computer screen waiting for me to get it right. When he finally got through the 3rd form, he aggressively added an “A” to my “U.S.” I had put down under citizenship and stamped it with some sort of red ink. He handed me my new ICBC debit card and waved me away. I crawled out of that office and have familiarized myself with a nearby ATM machine for future use. I recovered okay from the bank just in time to go to the Government Medical Offices of Shanghai. This is a compound with several buildings placed behind a cinderblock wall, where no civilian vehicles are allowed beyond the guarded gates. All foreigners coming into China on a work visa and any Chinese national planning to leave China for an extended amount of time are required to get a “healthy check” as part of the application process. This is the only processing facility in all of Shanghai so it’s busy and crowded. Greg and I were led into the first building where crowds of people were filling out forms and waiting for their number to be called. Again, Jessie took control. We found out that only Greg was registered in that building so we would need to split up. Sweat began to form on my brow. Jessie helped Greg through the form, registered him for his “exam.” As Greg was led off into a back room, Jessie took me to another building. Once your number is called the “healthy check” begins. You are told to go into room 104 where you are handed a robe and a key, sent into a room to change and lock your belongings into a locker. Your height and weight are recorded and you’re sent on your way being told to follow the yellow arrows placed on the floor to room 105. Room 105 is where you will have an X-ray taken of your chest. An X-ray from a machine that was most likely invented sometime in the ’40s. After the radiation room, you are sent to room 106 where you are asked to lay down on a table. A clamp is attached to both wrists and one to your right ankle. Before the patches were attached to my chest, I asked “what are we doing here?” to which I was given the answer “EKG.” Okay. A older women with thick glasses that had darken lenses demanded I come into room 107 and sit down. She was going to give me my eye exam. She pointed to four pictures that were taped to the table – a test for color blindness. I was asked to read the numbers that were somewhat hidden within pictures. When I state “668” she strongly stated “NO.” So I tried again. “868?” I guess it was correct because she just waved me on and said “next”. Room 108 was the ultrasound. When I asked “what are we looking for?” The very young nurse stated, liver and kidney. I guess I have both because I was quickly sent on to room 109. Room 109 was with a very bossy, older nurse who motioned me to sit and hooked me up to a blood pressure sleeve. I had crossed my legs when I sat down. She swatted my leg to get me to uncross them and told me to stare straight ahead and relax. I giggled out loud at the irony of her actions and request. When she finished she said “normal.” I stated “Excellent.” She had no time for my commentary. I was then sent to room 111 – not sure what happens in room 110 but I wasn’t looking for any additional testing. Room 111 was where they drew blood. At this point, I’m chanting “square melons, square melons, square melons” in my head and imagining I was at the Portland Clinic for a simple physical. When I finished, Greg was waiting for me in what look liked the Cedar Hills DMV, design inspired waiting room of building 3. He looked at me with the “remind me why you wanted to take a job in China” look. I knew one of the first foods Greg and I needed to try when we arrived in Shanghai was the dumplings. I knew because Anthony told us we had to. That’s Anthony of the Travel Channel’s show, Anthony Bourdain: No Reservations. It was included as part of our research when learning we were moving to China. Today, while we were out on our house hunting trip in the Xintiandi (shin-tea-n-dee, does that help?) district of Shanghai we had lunch at Din Tai Fung and knew we had to try the dumplings. The menu was simple and easy to read with both Chinese characters and English and also included pictures. The dumplings were one of the first items listed under hot features. Xiaolongbao is the name of the dish. Xiaolong meaning small bamboo basket and baozi meaning steamed buns. The whole name is translated literally as little basket buns. After we had placed our order with the waiter, a waitress brought over to our table a flash card and set one out for each of us. The flashcard was to share the proper way to eat the dumplings. 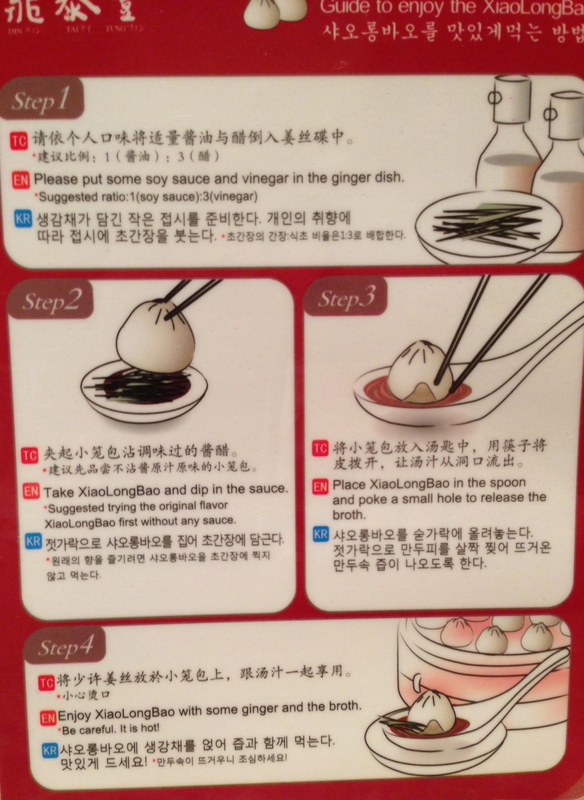 A dummies guide to eating the Xiaolongbao dumpling. How helpful. We studied the card and knew that the first small dish to arrive with an upright stack of thinly shredded yellow fibers was ginger. We knew to doctor that dish with a bit of soy sauce and vinegar because the flashcard told us. When our dumplings arrived in a bamboo steamer and the waiter took the off the lid, we each gently grabbed a dumpling with our chopsticks. Truth be told, Greg gently grab, I more like attacked, I’ll get this chopstick thing down, I’m sure. We dipped the dumpling in the ginger sauce and then placed it on the spoon, inside the small bowl and stabbed it with the chopstick to let the very hot broth seep out into the bowl. We followed all the directions and enjoyed our ground pork filled dumplings. They were delicious. The order had 5 small dumplings and we had to fight over the last one. As I was laying awake at 2am suffering from jet lag, I got to thinking. What american dish would we provide a flashcard to a foreign guest in an effort to share with them the proper way to eat it without making fools out of themselves? Well, first I had to come to terms that we would probably never go to this effort. But let’s say we did, what food would need explaining? Corn dogs. Corn dogs is what i came up with at 2:20am. It took me 20 minutes to filter out all the food not original to America to come up with the corn dog. I had to look it up to be sure, and sure enough it originated in the U.S. around the 1920s. It was fun to design the flashcard in my mind first showing the corn dog in a red and white checked paper bowl/plate. You’ve seen the bowl/plate. They use them at fairgrounds, ballparks and I think you can buy them in mass quantities at Costco. A bottle of ketchup and mustard would be shown in the next frame. A large hand squeezing the ketchup into the corner of the paper bowl/plate followed by the squeezing of the mustard. A warning would appear in the next frame showing one lifting the corn dog by the stick to the mouth “contents are extremely hot and may cause burning of the mouth and blisters that can last for days.” Use caution when biting into a corn dog would be the obligatory, legal sign off. In preparation for our upcoming move to Shanghai, NIKE connected us with a intercultural consultant. We spent a couple hours with Julie discussing what we wanted to gain from the experience of living in a foreign country and what our expectations might be. She spent focused and dedicated time on Greg as the spouse is usually the one in for the biggest lifestyle change. The employee is quickly swept into the NIKE world no matter what country and quickly becomes busy with work. She shared with us that the Chinese often spit. “What’s that?” As most people know I have a bit of a germ problem and the idea of spitting just here and there anytime one feels like it seems, well, just wrong. She then explained that when she’s working with the Chinese about moving to the U.S. they feel that blowing your nose into a piece of paper and sticking it in your pocket is well, just as wrong. She left us with a book titled Culture Shock. I have found it to be very helpful and have found some interesting useful tips when dining out. First is that slurping one’s soup is considered completely acceptable and burping at the table, during and after a meal is a compliment. But the most telling lesson I read was that when dining with a business client or out for a special event, eating everything on your plate only means you are still hungry and the host will pile on another serving. This is in direct conflict from the way I was raised. I was told, to eat everything on my plate. I was shamed into believing that “children in China are starving” and I was contributing to their hunger by not finishing the liver and onions served that night. Well, according to Culture Shock – this is simply not true. In China, had I left the nasty liver and onions on my plate I would have been sending the message that I was full, happy and content. And had I delivered a large belch at the end of the dinner, I would have been paying the highest level of compliment to my mom.